Businesses today are integrating technology into their operations in a myriad of ways. And while that's exciting, it can be all too easy to get sucked into making purchases prematurely and/or equally as easy to miss opportunities that present themselves. Staying ahead of the competition is about being proactive, not reactive. The only constant is change, and business technology is no exception. Being able to take a logical approach to the process of future-proofing your technology, assessing where you are, determining where you want to go, and plotting a path ahead is how you can prepare for the future. Let's explore that a bit, shall we? A business is only as prepared as its employees. Start your efforts at future-proofing your technology by hiring people with a pro-technology mindset-people who are savvy, motivated, and eager to use the latest advancements in technology. These individuals will understand that innovation is a constant and will not be averse to change or slow to embrace innovation. While we're discussing innovation, a word to the wise about adopting new technology. Although the latest gadgets and gizmos and bells and whistles may seem like must-have things, it's smart to avoid the temptation to be an early adopter. When you can wait just a little bit before diving in, you'll find that early iterations of technology will greatly improve by version 2.0. Follow the early adopters, pay attention to what they're doing, and listen for feedback on what's working and what's not. Learn from them, apply those lessons to your own purchases and strategies, and the benefits can be great. Is the nature of our core product changing? For example, movies are experiencing an evolution from primarily hard copies to primarily digital. Is technology driving an evolution of our core product? 3D printing, for example, is poised to revolutionize many industries. Is my competition changing in any way? This relates to their products, their services, and/or their strategies. Pay attention to what your competitors are doing, especially as it relates to technology, because that can help you stay competitive and profitable. Are my competitors using technology in a way that's different than what we are doing and/or doing something I should be paying attention to? Is my industry undergoing regulation or deregulation and how might this impact an investment we might make in technology? These are all factors that will drive a decision as to whether and/or when to invest in new technology for your business. As the world changes, so do consumer needs. A business technology investment may be the only way to meet these needs and stay competitive, but there are also other things to consider before committing to a complete overhaul, the most important of which is data. Most businesses have a wealth of data available to them that they may or may not be utilizing. And that data can be extremely valuable when it comes to making strategic business decisions. Make sure you're analyzing the data you've got in a way that will help you best understand consumer trends, business trends, business performance and the like. Updating your software on a regular basis is just good business, yet it's something that's often overlooked. Maximizing software performance guarantees that your business will be running at maximum capacity, while protecting against bugs and glitches. When possible, also consider updating your hardware. Adding extra disk space or adding more memory to the hard drive will slow down sluggish servers and speed up operations. Modern businesses run on massive amounts of data, so backing up frequently is essential. Consider an online backup service like to keep documents stored safely on the web. And if you don't want to mess with hardware and software any more than you need to, consider outsourcing your IT needs to a managed services provider. For a relatively small cost, that'll ensure your systems, hardware and software, are operating at maximum efficiency, are fully protected, and not requiring any of your time to maintain and manage. Future-proofing your business is important, and so is future-proofing technology. Start by creating a pro-technology, tech-savvy workforce wherever possible, avoid being too much of an early adopter, leverage data to help drive your decision-making processes, and be proactive with hardware and software updates. 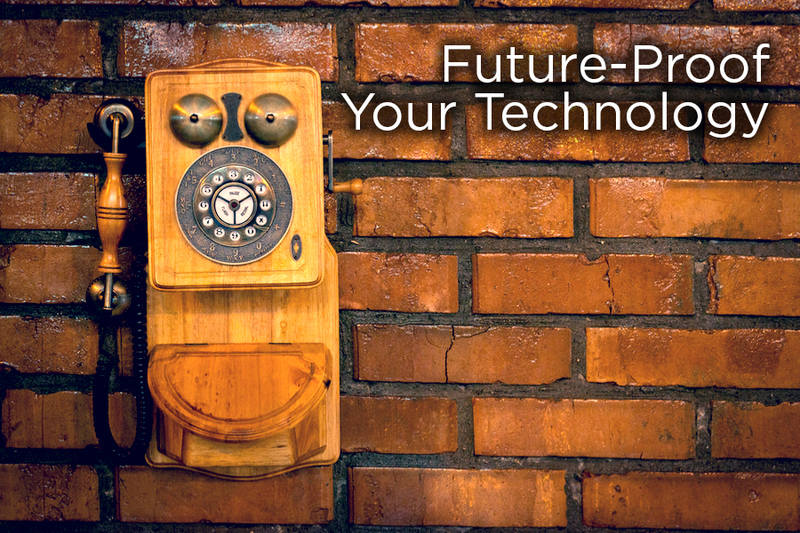 Have you future-proofed your technology? What's an important component of that that we might've overlooked? We'd love your thoughts.